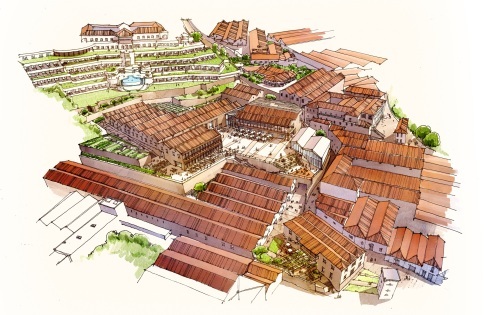 The World of Wine is the name of a new large-scale visitor attraction that is currently under development in Vila Nova de Gaia, centre of Portuguese port wine production and close to the city of Porto. Initiated by The Fladgate Partnership wine production conglomerate, the 100 million Euro project will cover an area of 30,000 square meters in its first phase of development, with additional 7,500 square meters available for future expansion. In the long term, the new visitor attraction is expected to create some 350 direct jobs. Highlight of the new wine experience world will be five different theme areas/museums: In the “Wine Experience” area, visitors will be able to learn more about Portuguese wines, the production of cork will be showcased in the “Cork Experience”. Interactive technologies await guests in “Porto Through the Ages”, a museum about the region’s long-standing history. The “Fashion & Design” theme area will highlight fashion and art of Portuguese designers, the exhibition “The History of Drinking Vessels” will showcase the variety of drinking vessels from ancient times to nowadays. Among the partners for the design and equipment of the exhibition spaces is British Scruffy Dog company.